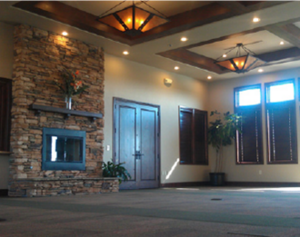 Centrally located in Erie, Colorado, The Vista Ridge Community Center boasts incredible mountain views, quick access to Boulder, I-25 and Downtown Denver. Whether you are looking for that perfect initimate reception location or the best place for your buiness meeting that is close to home The Vista Ridge Community Center has the atmosphere and amentities to make your event everything it should be. Catering available from the Colorado National Golf Club at Vista Ridge or choose your own caterer. Rooms for confrences, meetings, and social functions. Outdoor Pavilion, perfect for barbeques and family functions. Full size kitchen with stove and refrigerator in our Community Room. Beautifully appointed building styled in true Colorado Fashion. Complete with fireplaces and outside sun deck. • Take I-25 to exit number 229 go west. • Turn right on Vista Parkway. • We are on the right. Check our Rental Calendar to see if we have it available! Please contact us with your event requests. Our friendly and courteous staff are here to help!